The thinking behind this formula: People who have gained a lot of weight often feel socially insecure, ashamed of themselves and their bodies. Conversely, some people feel socially insecure FIRST and wind up with weight problems because of that. Feeling better about yourself, feeling more confident and secure in social situations are important parts of releasing the concerns that put us on the dieting path and often interfere with it being a healthy process. Add in the stress-producing conditions of our modern lives (worry about money, health, relationships, personal safety, politics, etc.) and you have a set up for difficulties in losing weight. The flower essences chosen for this formula support you around issues of self-esteem, social insecurity, stress, and related emotions of grief and anxiety due to past or present traumas. Mallow . . . useful if you feel embarrassed or insecure socially, or use weight as a barrier to feeling comfortable in the world and making friends. Mallow helps you feel more comfortable in social situations. Larch . . . useful for those who suffer from self-doubt and low self-esteem. If you worry about being judged about your weight and lack confidence as a result, Larch can help you feel freer to be yourself, have better expectations, and more self-confidence. Corn . . . is for those who feel stress from many conditions of modern daily life. It helps you feel safer, grounded and more at ease. Yerba Santa . . . for releasing held back feelings of grief, loss and pain. Five Flower Formula (also known as Rescue Remedy): for addressing fear or deep traumas from the present or past that keep you in a state of anxiety or make you turn to self-soothing behavior like eating too much, drugs or alcohol. DROPPER BOTTLES: (The traditional approach to using flower essences.) This is a 1 oz "dosage bottle" (already diluted to the proper strength). Take 5 drops under your tongue or in a glass of water or a favorite beverage 3 times a day (or more, at first, if you feel the need) every day until you don't need it (usually a month) to help initiate lasting change. You could also add 10-15 drops to a water bottle and sip it throughout the day instead. I include an information sheet for special circumstances in your order. Alcohol is used for a preservative (choose between conventional brandy or organic vodka). UNSCENTED FLOWER ESSENCE SPRAY: The same formula as the dropper bottles for those who prefer to use flower essences in the aura or for topical use. Use it at least 3 times a day for about a month. Organic vodka is used as the preservative because it is less likely to stain. You could also use this spray in the environment (say, in a group meeting or support group). Appropriate for children as well. 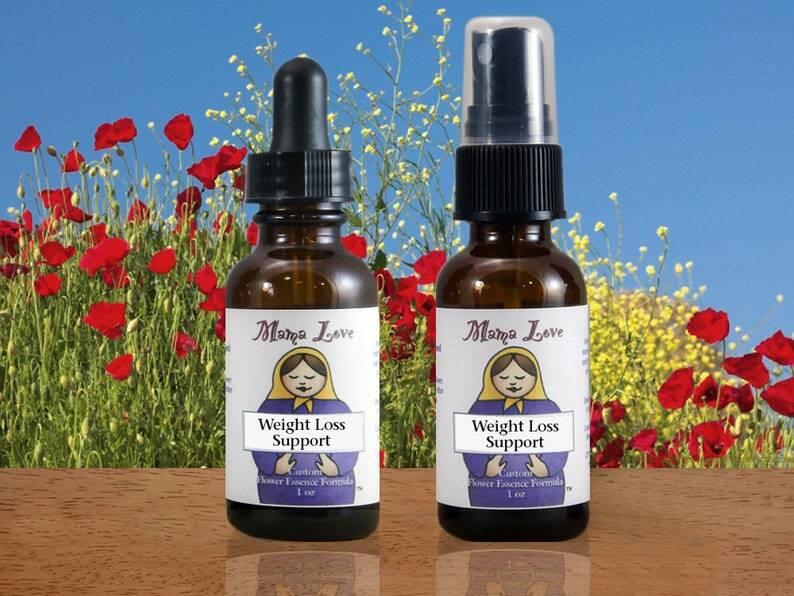 Available in 1 or 2 oz bottles. This particular formula is made on demand and is not yet part of my current standard list. I'm using labels I use for my custom blends and handwriting the name of the formula on them. The color of the Healer Mama on the label may not match the color shown. Legal Note: People with a history of allergy and sensitivities are advised to use caution with any product containing ingredients you are not familiar with. While this product is made responsibly and should be safe for most people, it IS possible to have a reaction to just about anything. Flower essences RARELY but occasionally bring up unexpected feelings that may need to be confronted. This is a great way to process and release them which can be the key to your healing; but, if you're not ready for it (or something else needs to be addressed first), resistance has been known (VERY RARELY) to trigger physical symptoms in sensitive people. It is best to stop using the formula for a couple of days and try again at less frequent intervals (once or twice a day instead of three times) or try a different approach. Let's talk! Because it is not yet part of my ready-made list I will need at least a couple of weeks to make shelf-appropriate labels, etc.